Above Right: From Malvern Springs the Flow of Friendship - during the reign of Edward the Confessor, Saint Werstan established his religious cell in what became known as Malvern and this led to the founding of the medieval Great Malvern Priory in England - the first and original Malvern. Within three years he was killed by the Celts who objected to his intrusion. Not only the Founding Martyr Saint, he is also Patron Saint of our springs and wells. Although now usually viewed in a non-religious context, St Werstan thereby became the founding father of the many Malverns throughout the world. Malvern Spring Waters flow out from the Malvern Hills in England and trigger abundant life in the surrounding lands, a metaphor for the friendship percolating throughout Malverns worldwide. To discover more about the founding of Great Malvern, the original Malvern from which others originated click 'Malverns' immediately below. alverns now exist around the world and their numbers are increasing. This project is an initiative to bring about active friendship between all Malverns. It is masterminded by the Friends of Malvern Springs and Wells from Great Malvern, England. 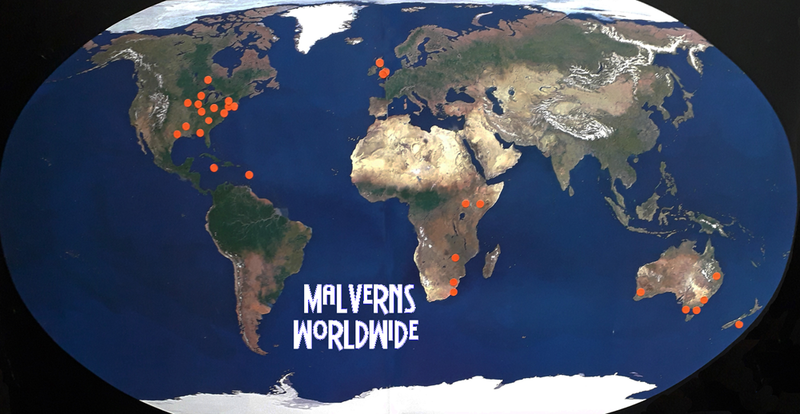 To find out more about specific Malverns - click on the name in the index below or email our International Envoys at the foot of the index. alvern Hill Virginia lies in Henrico County. This is the site of the Seven Days Battle of the American Civil War and is protected by the National Park Service. It is one of the oldest settlements in America. It was originally part of an estate and stately home granted by James I to Admiral Sir George Somers, whose family lived in Lyme Regis, England. On his death in 1610 his estate passed to his nephew Matthew Somers and then to Richard Cocke. By 1632 Richard Cocke was a member of the Government of Virginia. Click here to view YouTube. alvern Alabama took its name from Malvern, Virginia. This tiny lumber village was named by Civil War soldiers in honour of comrades who died in the Seven Days Battle of Malvern Hill. It lies in Geneva County and has a population of about 1000.
alvern, Chester County, Pennsylvania No official origin to the naming of the Borough of Malvern remains, although several theories abound. Today the buildings reflect the Victorian era when much of the town was built. The area was originally settled by Welsh immigrants in the 17th century who bought land from William Penn. (population 3,450) Click here to view YouTube. alvern Illinois, a small agricultural hamlet, was named by the local postmaster after Malvern Pennsylvania. It lies in Whiteside County just off the Lincoln Highway near the town of Morrison. Malvern dates from the mid 19th century and still retains its water mill which is a protected building albeit not still operating. alvern Texas is a township founded in 1839 in the cattle raising country just west of the Davy Crockett National Forest. A post office here opened in 1879 and was named Hardin's Store. 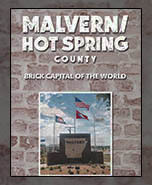 When the Harding family left in 1900, the township was renamed by the local postmaster after the Malvern in Pennsylvania. (population in 1940 was 128). Malvern lies midway between Dallas and Houston in Leon County. Centreville is the county seat of Leon County about 15 miles west of Malvern along highway 7.
alvern Ohio was located on a canal which brought prosperity to the locality but when the railways by-passed it and the canal fell into disuse the populace moved away. Located in Carroll County the population is still around 1200. It was first established in 1806 and was named after Malvern England. Click here to view YouTube. alvern Iowa The pioneer village of Milton was established in the fall of 1869. 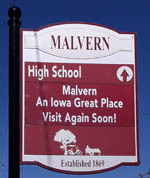 It was later renamed Malvern when it was discovered that there was already another Milton in Iowa. It prospered as a farming town and today Malvern is a rural community with its own infrastructure. Malvern, Iowa is situated just 38 miles southeast of Omaha. 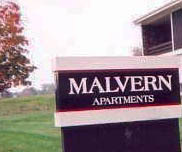 Located in Mills County, Malvern sits just off U.S. Hwy. 34. The former rail-road connection is now a cycle track. 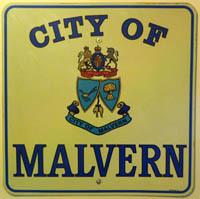 In the recent census, Malvern had a population of 1,142. Click here to view YouTube. alvern, Oneida County, Wisconsin lies just north of the Interstate 8 and prospered as a logging settlement as a result of the railway connecting it to the world at large. Malvern was established circa October 1882, when a railroad spur was built from Monico to Rhinelander. The naming was after the Battle of Malvern Hill in 1862. When the railroad closed the hamlet virtually ceased to exist. Malvern today is an unincorporated community located in the town of Pelican 6.5 miles south-east of Rhinelander. alverne New York was founded between the two World Wars on Long Island. The land was once occupied by the Rockaway Indians. Named after Malvern, England, it grew rapidly after WWII as a residential suburb. The 'e' was added in error by the Long Island Railroad and never rectified. (population 1,600) It is now a vibrant community near the sandy south shore beach. 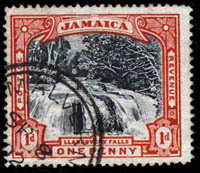 alvern Ontario (Canada) was named by David Brown who became postmaster of a nameless hamlet in 1856/7. He was born in Malvern Link, a suburb of Great Malvern, England. At the time, growing flax and hemp for making rope and linen where the principal occupations. Now a suburb of Toronto, the population is over 44,000.
alvern Maryland is located in Towson, just north of Baltimore and within Baltimore County. Maryland lies on the US east coast and Baltimore is between New York and Washington. alvern Hills North Carolina is a locality that prospered in the 19th century as a spa resort. It was 1827 when Robert Henry discovered the Sulphur Springs at Asheville. Three years later he developed a hotel on the hill above the springs. This was in the center of what is now Malvern Hills, and the 'healing waters' were very popular. 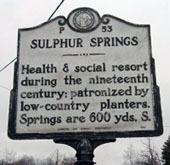 The Sulphur Springs Hotel was the first of its kind in Western North Carolina, and was once a tourist attraction for wealthy planters to the area during summers. By the 1840s almost 500 visitors per season visited the location when other recreation facilities were developed in the grounds. Today it is a largely residential area although the Springs Pagoda survives as a ruin..
alvern Jamaica is a settlement that was founded in the mid-19th century high in the Santa Cruz mountains. At approximately 760 metres in height, it was formerly a health resort for wealthy planters and landowners. Today it is renowned for schools and is considered to have the most delightful climate on earth. The population is about 3,440. 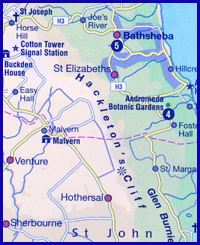 Click here to view MAP. alvern Barbados is a township on the border of St John and St Joseph parishes. Here Malvern, a former sugar plantation of some 315 acres (1913), survives. 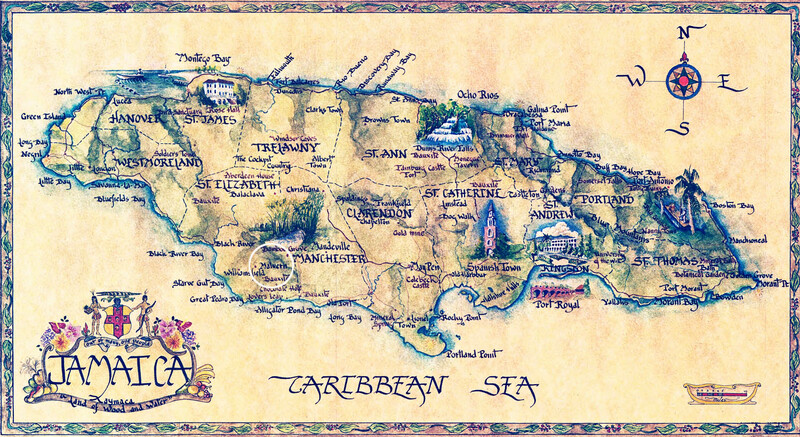 It lies on a 250m plateau behind Hackleton's Cliff on a similar latitude to Bridgetown, which is on the west coast. Bridgetown was a major international port for slave traffic. African slave labour was imported to grow the sugar in the fierce equatorial climate. There were 160 enslaved individuals recorded in Malvern in 1808. Ownership of the Malvern Plantation can be traced to 1652 when it passed from Richard Ellis to Seth Rowley. In 1802 Francis Shorey Bayley became the owner, passing it to his son Sir Francis Souper Bayley in 1808. 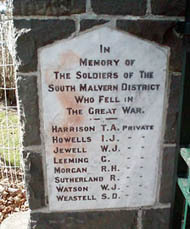 During this period the locality was named Malvern. 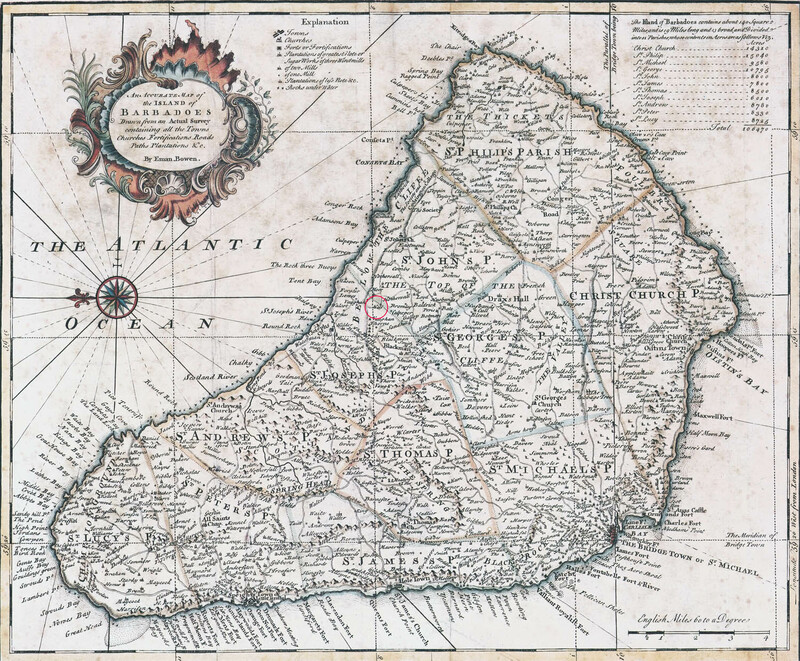 Click here to view 1747 MAP with the location of Malvern Plantation encircled. alvern New South Wales lies in Croydon, 10km from Sydney, It is a model suburb of inter-war housing dating from 1909 The Strand shopping area was built between 1913 and 1920 as an elegant boulevard between the railway station and the salubrious residential streets of Malvern Hill. This is considered a fine example of town planning and architectural fashions and is designated a conservation area. alvern Springs, is a new township development in Ellenbrook, near Perth, Western Australia first identified in our Newsletter 50. (click M left to view) It is about half an hour travelling time from the city. Houses are now for sale in this recently named scheme, celebrating the springs and wells of the Malvern Hills in England. A major consideration in the planning of Malvern Springs is the conservation of the high quality natural environment which includes wetlands. alvern New Zealand lies on South Island and was founded in 1877 as part of the Christchurch and Canterbury Settlement by John Robert Godley. Eventually Malvern, South Malvern and East Malvern were amalgamated in 1989 and renamed Sheffield in the Selwyn District of Canterbury on the east coast. This area of great natural beauty is under the watchful eye of the Malvern Hills Protection Society. alvern Johannesburg dates back to 1889, a nd was closely linked to the Jumpers Mine across the railway line in neighbouring Cleveland. Those early miners were from Cornwall. In those early days the suburb was known as Morristown, named after lawman Hyman Morris. In 1904 its name changed to Malvern, believed to be named after Malvern in England, a health spa with rolling green hills. The association was made because the verdant ridges of Malvern offered a pleasant respite from the bustling, dusty gold-rush town of Johannesburg. Located some five kilometres from the city centre, the suburb has its own slogan "The village suburb for families where neighbours are side-by-side friends." 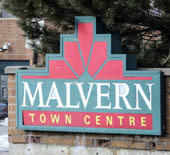 Today Malvern is noted for its friendliness and has a newsletter called 'Malvern Matters'. 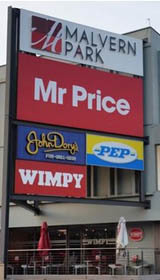 (population 10,550) It is sometimes referred to as Malvern East and is linked by the metro. alvern Durban is a dormitory town as well as a local industrial hub. The hilly area was settled by people working in Durban who wanted to escape the humidity of the coastal city. In 1924, four residential townships in the area, Malvern, Escombe, Northdene and Moseley combined to form the town of Malvern. In 1952, to celebrate Queen Elizabeth II's coronation, Malvern received municipality status, forming part of Queensburgh. It is linked to the city centre by metro. alvern Harare is a dormitory suburb in former Rhodesia which lies to the south west of Harare city centre. Harare was called Salisbury until 1982 and is the capital and most populous city of Zimbabwe. The Pioneer Column, a military volunteer force of settlers organised by Cecil Rhodes, founded the city on 12 September 1890 as a fort originally named Fort Salisbury after The 3rd Marquess of Salisbury, then British prime minister. There is also mention of Lord Malvern High School of Salisbury Rhodesia. This is located at Waterfall, 15km from Harare. alvern is a farming area in the Aberdares formerly in Mau-Mau lands. The Aberdare Range is a 160 km long mountain range of upland, north of Kenya's capital Nairobi with an average elevation of 3,500 metres (11,480 ft). A group comprising the sons and daughters of Mau Mau fighters in Kenya's struggle for independence went the Aberdare Range and some roads were renamed after the freedom fighters. alvern College lies near Kampala in former Uganda. alvern Warwickshire Malvern Hall is a former stately home just east of Solihull parish church in Warwickshire. It comprises an early 18th century mansion that over the years has been much altered. 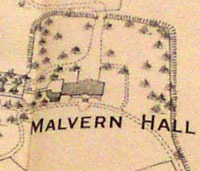 The Hall lies in extensive landscaped gardens that are the principal surviving local area that bears the name Malvern. Former occupants whose coats of arms are displayed on the entrance gate posts are Lewes, Greswolde and Tollemache. Other significant local buildings that are designated Malvern include Malvern Park Farm, also once known as Witley or Whitely and Malvern House. The late 16th century farm house lies about half a mile south of the parish church. Malvern House lies between the church and Malvern Hall. Today Malvern Hall is a girl's school and the historic farm house a private residence. 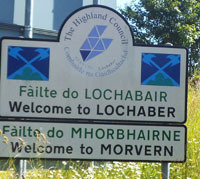 orvern Scotland Morvern in Highland is a parish in the western highlands of Scotland. It occupies an inverted pyramid shaped peninsular of land approximately 25 miles wide and 15 miles from north to south. To the north Loch Sunart and to the south-east Loch Linnhe isolate Morvern. The principal settlement is Lochaline to the south, from where the ferry can be taken across the Sound of Mull in the south-west, to the Isle of Mull in the south. A single road across the peninsular, the A884, connects the port to the mainland. Most of the landscape is typically glaciated mountains and valleys dotted with conifer plantations. The population is only about 300 persons, supplemented in summer with tourists, particularly from Holland and Germany. Great alvern, England - the grandparent, Malvern together with Malvern Link, West Malvern and Malvern Wells - explore our web site pages to learn more about us, our origins dating from the time of Edward the Confessor and our Springs and Wells around the Malvern Hills. Click here to view YouTube. If you know of any Malverns that we have missed or can add to our information do contact our International Envoys Cora Weaver or Bruce Osborne with an email. For information on the Mulberry Tree project click website below.